Funny you should ask. Those are my way of adding fabric to dress up my windows, much like the valences of the 90’s did, but in a much more updated way. And they aren’t really roman shades, although they look like roman shades. They’re actually just faux roman shades, which means they don’t function (go up and down.) But they do hide the hardware of my roller shades and they do give me an excuse to add some fun fabrics to any space. So faux roman shades have become a go to window treatment of mine and today I’ve teamed up with my friends at Fabric.com again to show you how to make your own faux roman shade so you’ll have a good excuse to buy some fun fabric too! Measurements- You’ll want the width of your fabric to be the width of your window plus 9 inches to allow for seams and for overhang. The length depends on how you are planning to hang your faux roman shade. I hang mine well above the window so that the finished faux roman hangs only about 3-4 inches into the window frame. The faux roman I made here is 18 inches tall. You’ll need to adjust accordingly if your dimensions are different. A white twill home decor fabric works perfect for this. You may want to use a dark color if you’re using a dark fabric on the outside. A sewing machine- this is my favorite, not too expensive and not too complicated machine. Step 1: Cut your lining fabric. Step 2: Measure for your side seams. The width of your fabric will be the width of your window + 9 inches. This will allow the faux roman to go beyond the edge of the window frame 1.5 inches on each side. If you want it to go further you’ll need to add to this measurement. The length of your fabric will depend on how big you want your folds. You may want to start with a long piece and cut it once you’ve planned your folds. To give you an idea, my fabric was 50 inches long. Step 3: Sew the side seams of your faux roman shade. 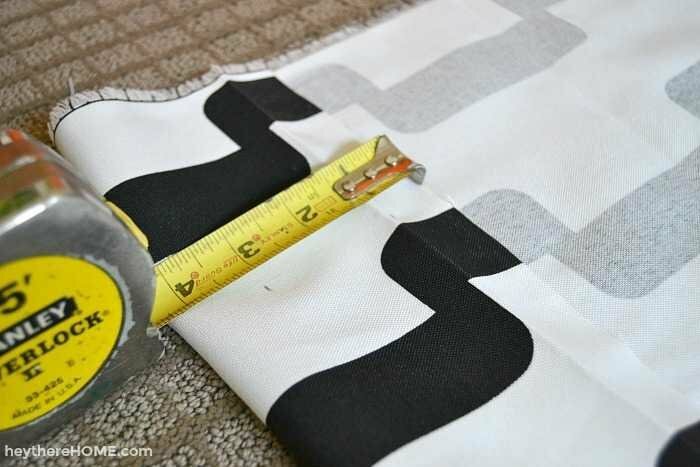 With the good side of your fabric facing down, fold one side edge over and measure 1 inch in from the edge and make a mark, then measure 2 more inches in from the edge (for a total of 3 inches in from the edge) and make a mark. Repeat this down the edge about every 10 inches. Step 4: Prepare your edges to be sewn. 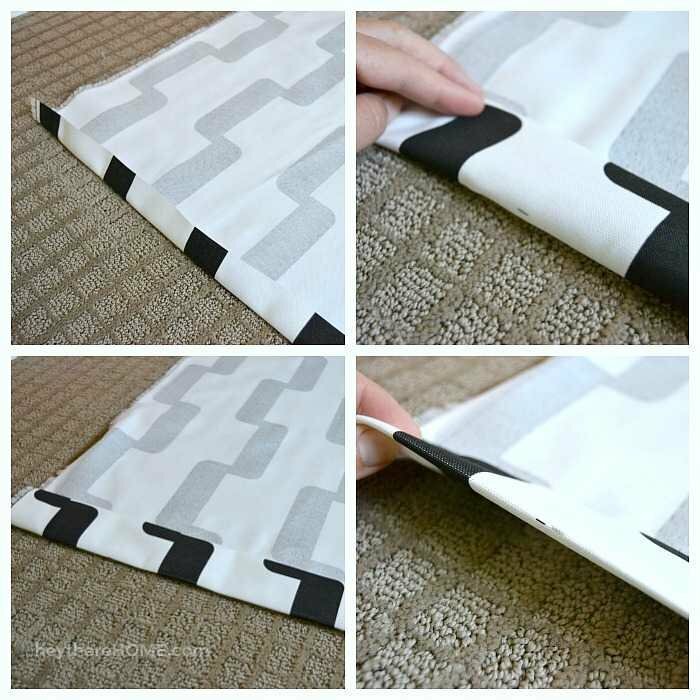 Fold your fabric along the 1 inch mark and iron flat. Then fold again at the 3 inch mark and iron flat. The mark you made should be right on the edge of your fold. Step 5: Sew the sides of your faux roman shade. 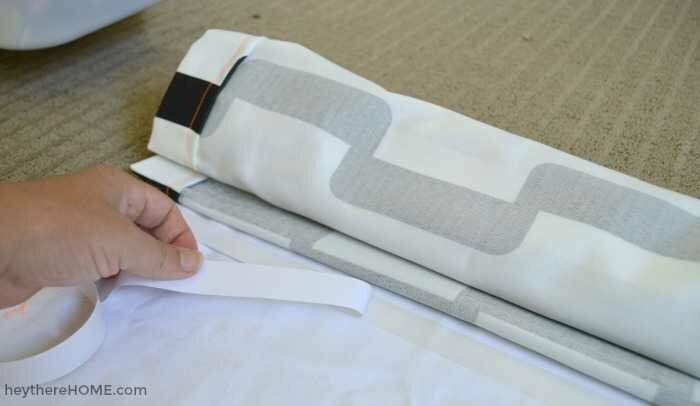 Using the edge of your fold as a guide sew a straight line down the side of your faux roman shade. Repeat steps 2-5 on the other side of your fabric. Step 6: Sew the bottom seam of your faux roman shade. Once the sides are sewn, repeat steps 2-5 along the bottom edge of your faux roman. Step 7: Attach your lining. Lay your top piece of fabric good side down and lay your lining piece on top lining up the top edge of your fabric and top edge of your lining. Sew along the edge leaving the edge raw. Step 8: Plan your folds. Turn your faux roman good side up and, making sure to leave your lining piece flat, start creating your folds. It’s best to put a heavy book at the top of of your faux roman to hold it in place and just start playing around with the folds starting with the top one first. 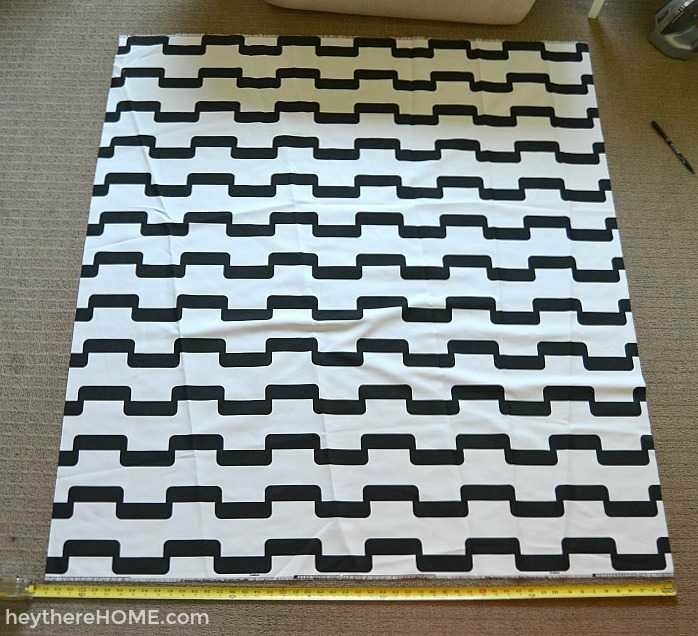 ***You’ll be folding the top of your faux roman over a board when you hang it, so keep in mind that about 3 inches at the top won’t be seen when planning your first fold. You’ll want to make sure that the folds are straight, so it’s often best to get one side looking good, then measure down from the top and adjust the other side accordingly for a perfectly straight fold. You’ll want the underside of each fold to be just under the flap of the fold before it so that your seams won’t show on your finished project. Once you have your folds planned, you’ll need to make some marks: First, reach under with your fabric marker and make a mark where the under side of each fold is on your lining piece. Then carefully lift each fold and make a straight line with your fabric marker across your fabric. 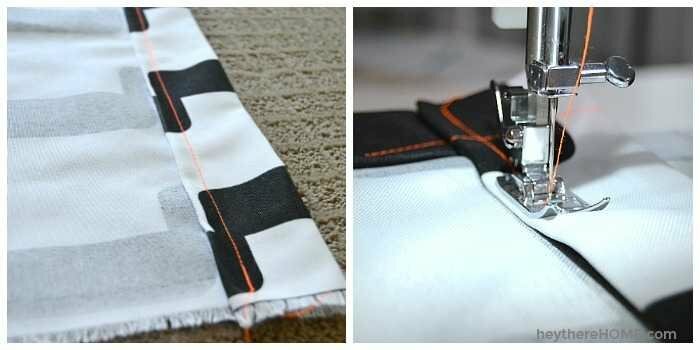 This will help you sew a perfectly straight line. Step 9: Sew your folds. You’re going to sew one fold at a time, which is why you made marks. So take all your folds apart except your first (top) fold. Gently roll your fabric up and over so that the line you drew for this fold is still laying flat on the lining fabric and place a piece of double sided hem tape just below your top fabric, so that when you lay it back down it attaches the back side of your top fabric and the top side of your lining fabric. The line you drew on your fabric and the marks you made on the lining fabric should match up. This is just to hold it in place so you can sew without mistakes. Step 10: Sew your fold. 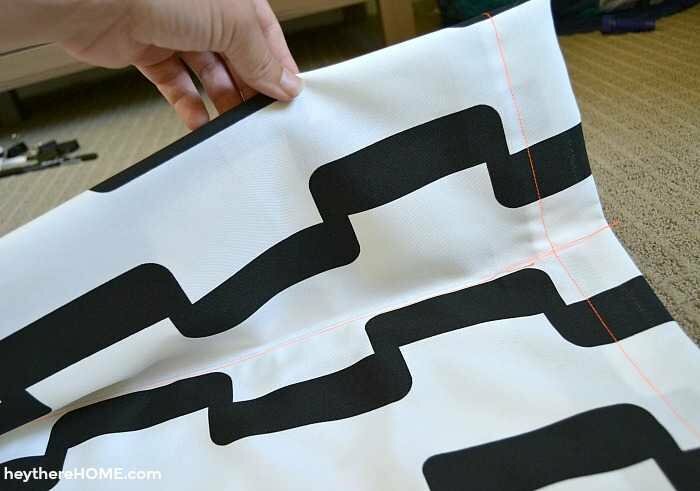 Place your faux roman on your machine and sew a straight line along the line you made for your first fold, but be sure you’re only going through one layer of your top fabric and the lining piece. Step 11: Repeat for each fold. Lay your faux roman good side up and create your next fold based on the marks you made when you were planning your folds. The line you drew should match up with the mark you made on the lining fabric. Roll the fabric up, lay the tape, and sew for each additional fold. Step 1: Cut your 1 x 3 board to about 3 inches less than the width of your window. Step 2: Start your screws into your board but don’t go through the board. The screws at the edge should be about 3-4 inches in from the edges, than one in the middle. 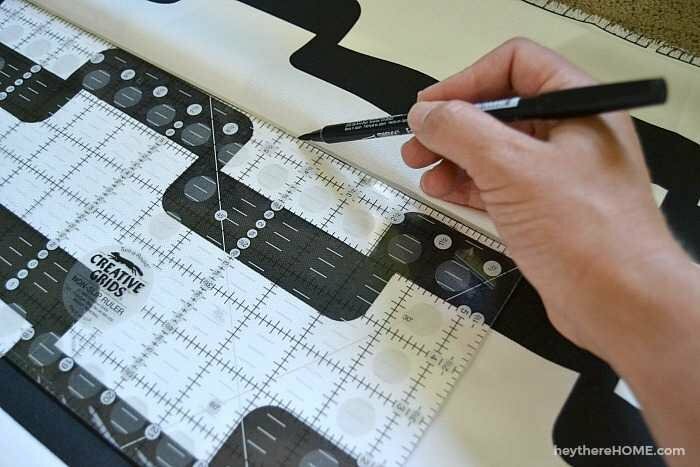 Step 3: Lay your faux roman shade out, good side down, and lay your board on top, lining up the edge of the board with the top edge of your fabric. 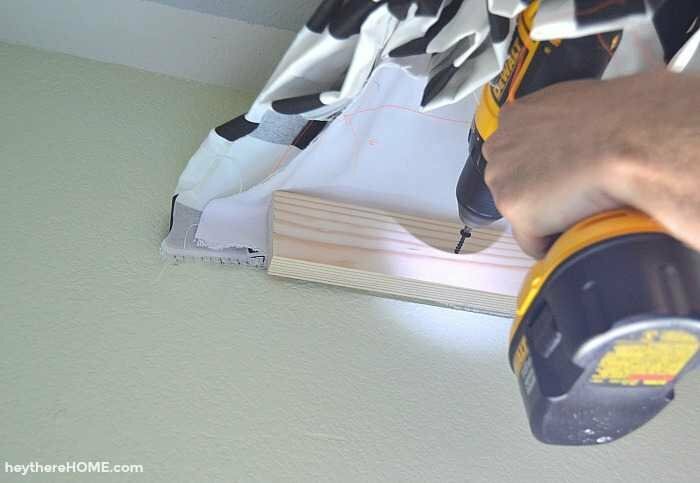 Lift the board with the fabric and continue your screws through the board (going a little slow) so that they go just through the board and the fabric. Step 4: You’ll need a buddy for this part. Hold your board against the wall above your window making sure that your faux roman is centered. 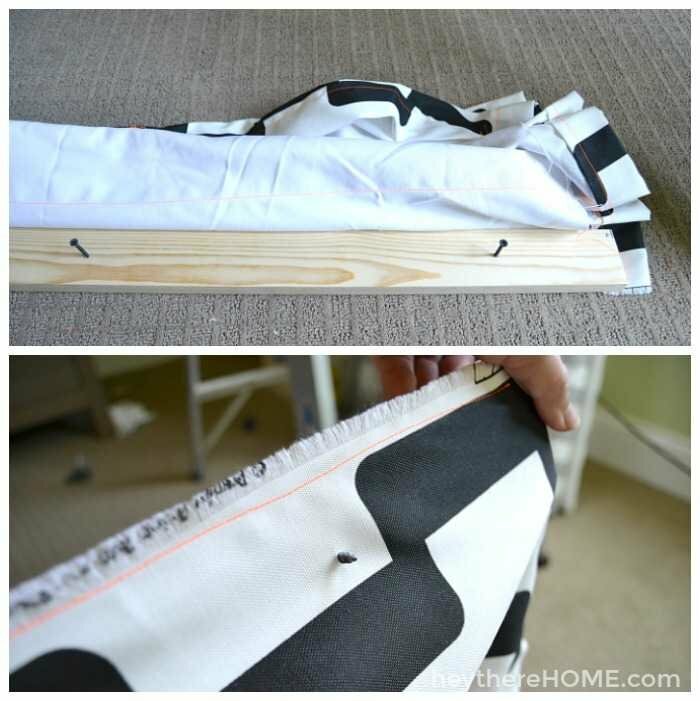 You’ll want to make sure that the fabric goes past the edge of the window evenly on each side. Holding the board against the wall, lift the faux roman so that you can continue screwing the screws in. Start with the middle screw then, using a level, check that the board is level before drilling the side screws in. Step 5: Let your roman shade down and adjust the folds so they look nice. 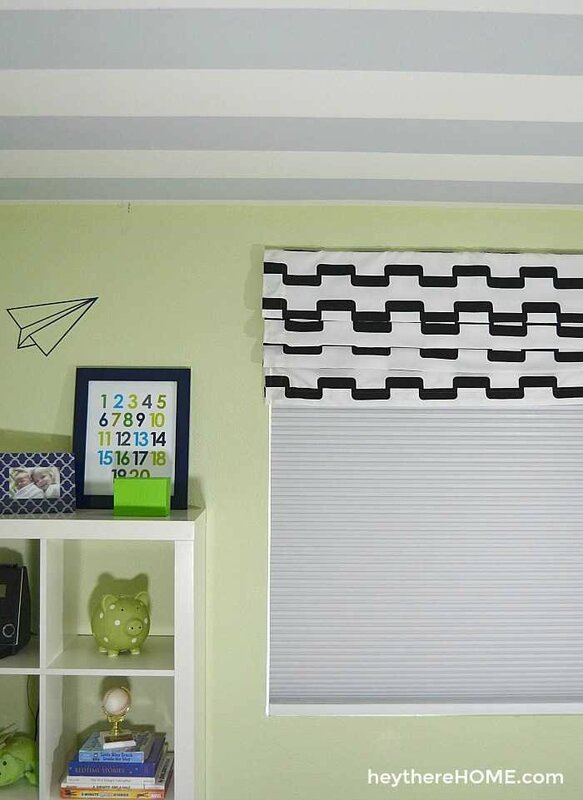 Perfect way to add a fun fabric to a space and hide the hardware of the new blackout shades we put in when they’re pulled up! I’ve made these faux roman shades in my family room and in my kitchen too! Your turn! Go pick out a fun fabric and get creating! A big THANK YOU to Fabric.com for partnering with me on this post. They have always been and continue to be my go to source for home decor fabrics. Opinions are 100% mine. I am having a hard time figuring out how you will not see the seam on the top fold. The other seams will be hidden by the other folds but now the first one. How is the first one done? Thank you for posting. Might it work if I Velcro fabric to top of the board to avoid nailing through the fabric?? Hi Kayco, Yes. I do think that will work. You should dry fit it first to make sure it looks the way you want it to on the sides but I think it will work just fine! Great idea! What a great idea! I love it, looks so good! Looking forward to make this at home! Thanks a bunch Kelly; good luck with yours! I simply love your faux roman shades! I think maybe I would add a blue tone on my windows, it would look great. Thank you for the tutorial!